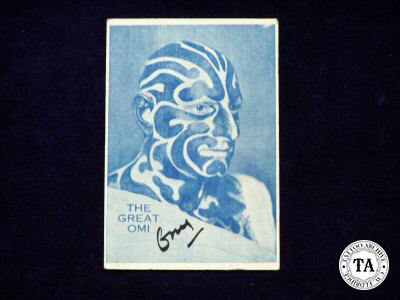 The Great Omi was one of the most popular showmen of his time. He was tattooed over much of his body including his head and face, which had bold black zebra-like stripes. Sometimes referred to as the "Zebra Man", Horace Ridler, (his real name) was born in Surrey, England around 1892 to a wealthy family. He served twice in the British Army as a commissioned officer, but left the military after the First World War, at the rank of major. But Horace Ridler had bigger plans! 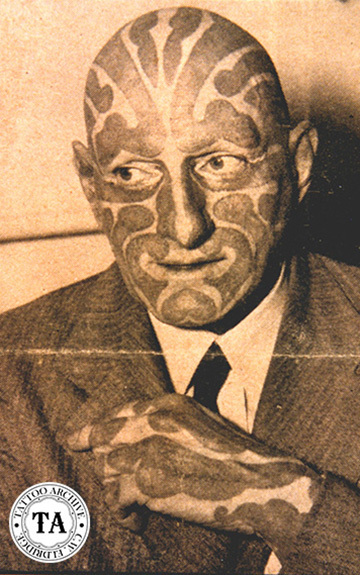 In 1927 he first visited London's famed tattooist, George Burchett, with a plan that would transform him into the greatest modern tattoo attraction in the world. After much discussion and written approval from both Horace and his wife Gladys, Burchett took on the work. The design of the wide black stripes would cover his old work and, by Burchett's account, 150 hours later Horace Ridler became The Great Omi. As soon as the tattoo work was completed the job offers rolled in from Bertram Mills Circus, Robert Ripley's "Believe It Or Not", Ringling Bros. Barnum & Bailey Circus and the Bellevue Circus, to name a few. Gladys Ridler worked with her husband and became the Omette, introducing the Great Omi to the audiences of the world. As the years wore on the Omi's appearance became more and more outrageous. He took to wearing lipstick and nail polish and signed his pitch cards, "Barbaric Beauty". Despite his appearance, "underneath it all, I'm just an ordinary man," he insisted shortly before his death in 1969.